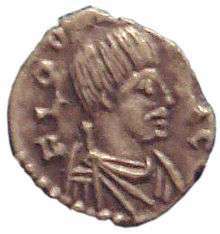 Adaloald (602–628) was the Lombard king of Italy from 616 to 626. 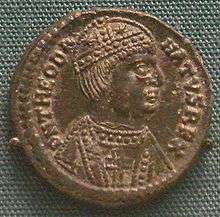 He was son and heir of King Agilulf and his Catholic queen Theodelinda. He was baptised shortly after his birth in 602; the abbot Secundus of Non (later historian) was his godfather. He was an associate king, raised on the shield by the warriors at his father's request, when still young. Upon becoming sole king as a teen, he reigned under his mother as regent. Adaloald went insane and lost the support of the nobles. He was deposed in 626 by Arioald, a Lombard noble from Turin and husband of the king's sister Gundeberga, who was hostile to the Catholic Church. 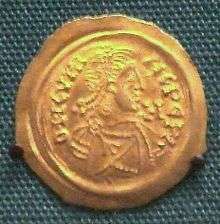 Adaloald died mysteriously in Ravenna shortly after (628). ↑ Grun, Bernard (2004). The Timetables of History : a historical linkage of people and events (4th ed.). Simon and Schuster. ISBN 978-0-7432-7003-8. p.54. ↑ William Dudley Foulke (1907). History of the Langobards. Philadelphia: Longmans, Green & Co.,. p. 352.